Android Marshmallow vs iOS 9 comparison: which next-gen OS will prevail? Android Marshmallow has now been joined by iOS 9 in being officially unveiled to the world. iOS 9 might arrive to devices first, but both operating systems will land within weeks of one another, although of course, the Android roll-out will be more drawn-out than the overnight push of iOS. But how will they differ? Find out in our Android Marshmallow vs iOS 9 comparison. Android 6.0 Marshmallow update: when will I get it? 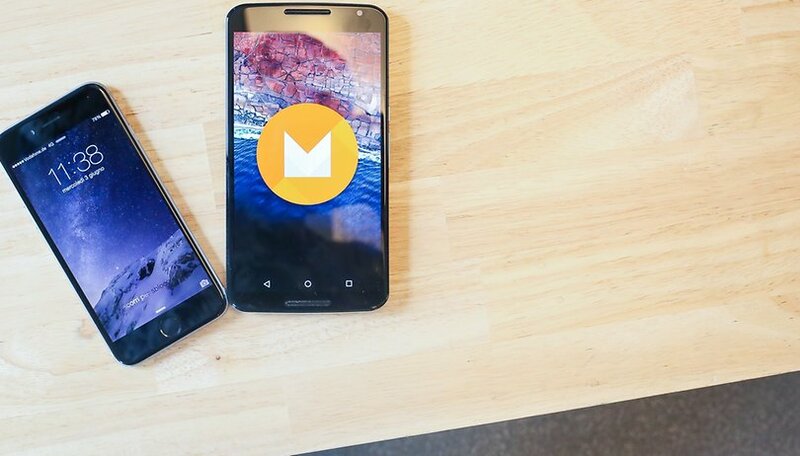 Android M was unveiled at Google I/O in May and then confirmed to be Android 6.0 Marshmallow on August 17. Marshmallow is expected to be unveiled on the two new Nexus devices at a Google event to be held in San Francisco on September 29. As with previous Android updates, non-Nexus devices may take considerably longer to get the latest and greatest Android version. iOS 9 was announced on June 8 at Apple’s WWDC event and was unveiled at an Apple event on September 9 alongside the iPhone 6s and iPhone 6s Plus. The beta version of iOS 9 became available in July and the final version will be pushed out to all iPhones on September 16. There's not much to report on Android Marshmallow's interface; it more or less retains the Material Design look of Android Lollipop, with a few tweaks such as a refreshed app drawer and new-look clock. We're happy with this though. The Lollipop interface was a complete refresh on what came before, and we're keen for Google to refine it and improve it rather than completely overhaul things again. Android Marshmallow is all about adding more user-facing controls and refining the changes introduced in Lollipop. There's a dark theme (that may or may not make it to the final version), adjustable Quick Settings and status bar, a rotating home screen, visual voicemail, new RAM manager and simplified storage and battery sections. Apart from a new font style, iOS 9 is also largely keeping things as they were. However, a crucial development in Apple's next operating system is a focus on adding so-called 'Intelligence' to the OS. This involves small context-dependant touches that track your usage of your phone and your location to optimize various features to what you're doing. For example, if you plug headphones in when you're at the gym, iOS will jump straight to your workout playlist. There is also now an API for the search bar in iOS 9. This means that developers can now integrate their apps into iOS, so you can search for information within apps and have it appear without going into the apps themselves. For example, you can use iOS search to look for sports results in the ESPN app, or recipes in All Recipes, and your desired info will pop up right there and then. Pretty handy. Multitasking support on the new iPad Pro is also a major feature, with multiple applications being available from the Microsoft Office suite to new additions from Adobe's Photoshop suite on iOS 9. There's some pretty cool capabilities with the hardware of the new iPads and iPhones including real-time rendering at 60 fps. Developments in the voice-assistant technologies of both Android and iOS are a crucial battleground. Both companies have something to brag about in this area with Android Marshmallow and iOS 9. Google Now's star feature for Android Marshmallow is Google Now on Tap, which in early June we declared as Android's coolest feature. With the feature, Google Now will understand the context of your question based on the app you're in, so when listening to music you can just ask "is he alive?" or "what's his real name?" to find out those details about who you're listening to. Alternatively, holding down the home/Google Now in a text message where someone's asking about where you want to eat that night will instantly bring up nearby restaurants without you having to say anything. Siri is making similar contextual advancements in iOS 9. If you have a meeting coming up with someone in a few hours, Siri can use the data from your e-mail and add that person to your home screen temporarily so you're just one tap away from calling them. If you get a call from an unknown number, Siri can also use information on your phone and in your e-mails to suggest who that person might be. Siri has been supercharged to search through all of your iOS software, including iTunes, apps and contacts. Kind of like what Google Now has done since Android KitKat back in 2013. Ahem. One of the most important changes in Android Marshmallow is the revised permissions system. No longer will apps demand access to your medical data, your most intimate photos and the password for your online banking account. With Marshmallow, permissions will be requested as and when you need them – and you’ll be able to say no to individual permissions without breaking the app. If that sounds quite iOS-y, that’s because it is – but a good idea’s a good idea irrespective of who does it first, and Apple’s quite happy to take ideas from Android too. Despite Apple tracking your phone usage and sending algorithms through your emails to optimize some of Siri's new features, Apple gleefully emphasized that all the data it gathers is stored 'on-device' and remains strictly private and for your own benefit. This is, of course, a dig at Google, who have a patchy reputation for privacy due to their use of customer data in making Google the world's foremost advertising platform. One upshot of Marshmallow on the security front is native fingerprint scanner support, taking it out of the hands of manufacturers and putting it into Google's hands. Not sure if that makes you feel safer or not. Of course, Apple has had a native fingerprint scanner for quite some time now. Battery life is a major focal point for Android Marshmallow. Under the hood there’s more optimization for power usage and a new feature, Doze, to improve standby time through the use of motion detectors – so your phone will know if you’re not using it and power down accordingly. This, combined with the App Standby feature – which lowers apps' background activity when your phone's in standby mode – drastically improves battery life, according to early tests. There’s also USB-C support for much faster charging. While Apple wasn't nearly as fixated on battery life as Google, it did announce that a new 'low power' mode in iOS 9 would potentially boost battery life by an extra three hours. Apple also said that standard battery life in iOS 9 would improve by an hour. No surprises that Apple is keeping tght-lipped about the size of the actual batteries in its new iPad Pro, iPhone 6S and iPhone 6S. We'll have to wait for the first teardowns to see just how big the cells are, but at least we know Apple is interesting in managing things on the software side. Android is playing catch-up with Apple when it comes to mobile payments, and to that end is giving its system a major reshuffle. What until now was known as Google Wallet will be re-branded as Android Pay. Like its predecessor, it will use NFC to let customers make mobile payments initially in 700,000 locations around the US (we think it's no coincidence that Apple said Apple Pay was available in 700,000 locations back in March). The Apple Pay developments revealed by Apple at WWDC 2015 sound like more of the same from Apple, while expanding into new markets. For example, from July you will be able to use Apple Pay on public transport in London, and Apple Pay will be compatible with 70 percent of UK credit cards. Comparing Apple and Android is a bit like comparing apples with things that aren’t apples: if you’re wearing an Apple Watch, tapping on an iPad and holding an iPhone to your head you won’t care what’s in Android Marshamllow and if you’ve got the Samsung logo tattooed on your sternum you probably won’t be too bothered about iOS 9. But it’s interesting to see how similar the two different operating systems are becoming: Google has clearly taken a leaf out of Apple’s book on payments and Apple has clearly noticed why people love Google Now so much. That’s fine by us: if the best ideas from each camp make their way to each other’s rival platforms, that’s great news for the people who buy the products. Arguably the most important job both operating systems have to do is bug fixing. Both Lollipop and iOS 8 were radical updates, but both brought with them a ton of problems. Of course, problems aren't a popular topic at special events, so we heard nothing about what either company would do to address them in Android Marshmallow or iOS 9. But the success of these intriguing (if not exactly revolutionary) OS updates will depend on how well they iron out the problems of their predecessors. What do you think? Is this competition good for Android users, or should Google and Apple come up with their own ideas in isolation? Let us know in the comments. August 17...September 29... sure wish the YEAR was appended. Samsung should create their own OS, it'd be called SOS lol. It would make them more competitive with Apple and stop reliability on Google with Android. I have a Galaxy S4 but considering moving to iPhone 6s next as its just easier, same make of hardware and software and instant updates instead of waiting for Android to be rolled out to different devices. Also new technology like paying with your mobile comes out on iPhone first as its easier to implement. Every aspect of Android is second rate. Its a nice comparison with detailed snaps which make sure that made us feel easy to compare to give vote to a better one which we've seen. I'd like to appreciate for that effort you've taken here to demonstrate us clearly. Full of wannabe funny jokes that don't make you laugh. Only part I liked was Google Now vs Siri. I don't remember paying for a single music. My galaxy s2 was updated to jelly bean by official ota. But cant actually use the iPhone 4s with ios 9 so slow have you tried it?bet you haven't. As for the specs you are going on about its because ios is so restricted if you are just phoning txt & going on the web of course it's fast but try something else it can't. Do you really have to advertise that you don't know what you're talking about. All you complainers of lollipop.....ummmm. Don't complain if using your stupid Samsung !!!! Google isn't responsible for their forked version of Android !!! Buy a phone that runs Android !!! Yes I've noticed bugs on my nexus 6.... But nothing serious and nothing that'd push me to buying an Apple ! Face it... Buy an android and install any app you want... Or go buy an Apple and wonder why some apps don't exist because of apple saying its "their" phone after you spend $800 on it. I completely agree with you. Android is not to be blamed because of some screwed up custom Samsung and HTC OS. If android is to be judged, then they must first get the original lollipop. You're also right at the second point. Even after buying an apple device, it's not completely ours. They have thousands of restrictions. Even they don't want their users to jailbreak. Apple is a closed source platform. Whereas android is not fighting rooting. They give freedom to their users. In apple we have to buy everything, pay for songs, videos, etc. In android we have the freedom to buy/get stuff for free. I'm proud of having Android. Yeah, any app you want. Like all the apps that exist only for iOS. I think it's too early to judge Android OS M vs Apple iOS 9. I do agree that both smartphone OS covered in this article are neck to neck in quality (improving and making the smartphone experience more stable is essential),. I'm not surprised that Microsoft OS is being ignored (today at E3, Microsoft made a strong impression with its surface tablet, pc's and Xbox game Council with regards to Windows 10 - and there was zero mention of a Microsoft smartphone this year). As for what the future will bring? Hopefully, consumer interest in price + specs + readily available updated OS downloads + battery life are what the developers will be paying attention to. My opinion is that, although it did bring a lot of features, Lollipop is the worst thing that's happened to Android. I got so frustrated with the bugs and the problems that came with the update, that I gave up on it and downgraded to KitKat! Although Lollipop did bring the much needed aesthetic changes, it definitely feels like Google delivered an unfinished OS. Having used iOS 8.x for a few months, I am happy with it overall (Yes, I was disappointed with the space that the OS consumed, but looks like Apple has fixed it in iOS 9). Google needs to cut down on introducing new features and make the existing ones stable. And, that's why I am getting more interested in iOS now! Android M does look interesting. But I am skeptical about the update. Lollipop was a battery hogger! The 'doze' feature in Android M looks like a welcome thing, but since it uses the device's motion detectors, won't those sensors consume battery? The most horrible of it all - the memory leak bug in Lollipop - Google should have fixed it in one of the 5.0.x updates. But there's still no official word on whether it's fixed in Android M or not. Also, Lollipop upgrade was not done timely, even on the Nexus devices, forget about the other OEMs. So, even if Android M does make all the needed bug fixes, which devices get the update is in the hands of the manufacturers. As for iOS, they are introducing few new features, and making the existing ones more stable. Whether one company copies features or borrows them from the other, or not, is a different matter of debate. But I think if it's a useful feature, and if one implements it better than the other, I won't bother who copied from whom! There was a time when Apple was playing the catch up game with Android. But now, it seems that the two OSes are head to head. I think Android, post Lollipop update, needs a lot of clean up. And, hopefully, Android M is the answer to that. And if it is, Google, this time, should put a lot of pressure on the OEMs to deliver the M update, at least to all the devices affected by Lolli-crap! I have been using the Android m developer preview 3 for a week cause of the problems that you mentioned. The battery life is better on it especially when it goes to deep sleep. On lollipop I could get a sot of 2 hours on m I can reach about 3/3,5 hours. I always read about these "bugs and problems" with Lollipop, but my phone (Nexus 5 from the Play store) has been 100% rock solid. If I had a complaint about Lollipop, it would probably battery life, but it's not so horrible I can't deal with it.